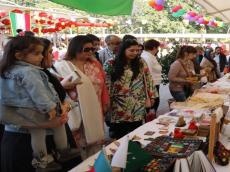 The Azerbaijani Embassy in Pakistan has been represented at the charity fair, organized by Women's Association in Islamabad. The event brought together local companies, foreign embassies in Pakistan, Azertac reported. Each country demonstrated its cultural values, traditions, economy and tourism potential. National pavilion featured various materials dedicated to the Azerbaijani-Pakistani relations, the aggression of Armenia against Azerbaijan, country's socio-economic development and tourism potential. Guests also enjoyed souvenirs and delicious sweets. The participants of the charity fair showed great interest in the Azerbaijani pavilion and welcomed national folk music with applause. Addressing the event, Pakistan's first lady Mahmooda Mamnoon Hussain praised the charity fair. She said that the event serves as a support for unofficial diplomacy and solidarity among nations and cultures. The President of Women's Association, Ayesha Haq said that the organization helps the disabled people, people who suffered from various disasters. She also thanked the embassies and companies for their active participation. All the funds collected from the event will be sent to charity. Pakistan is one of the oldest and closest allies and strategic partners of Azerbaijan in Asia. The Islamic Republic of Pakistan is one of the first countries that recognized the independence of Azerbaijan on December 12, 1991. The two countries also share common views on major regional and international issues and cooperate closely in the regional and multilateral forums, including the United Nations, the Organisation of Islamic Cooperation and the Economic Cooperation Organisation.